I’ve been a Sherlock Holmes fan for as long as I can remember, first because I read the stories, and second because of the Granada Television series starring (the late) Jeremy Brett. 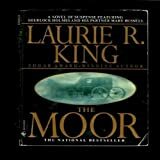 Because my reading patterns tend to be immersion-style (I read everything I can find by one author, all at once, then move on), when I was introduced to Laurie R. King’s Mary Russell series, I read the first three over the space of a weekend. I bought The Moor, started it, then apparently didn’t finish it – probably my reading mood changed mid-way through. I finally picked it up again the other night, needing something to distract me for a while, and I finished it this morning. As with all the Mary Russell novels it’s fairly formulaic, but then, the original Holmes stories were, as well. The lead character – Holmes protege and wife, several decades his junior – is a bit too perfect at times. Yes, she gets hurt, but she still comes off as a Mary Sue too often. Still, the novels are enjoyable, written in a style very like the original Arthur Conan Doyle creations. One note: While they can be read singly, these novels are full of in-jokes and references to previous adventures. If you haven’t read the original canon, or if you don’t read these books in order, much of it won’t make sense.